Those suffering from chronic pain from diseases like fibromyalgia are finding relief with CBD. Taking CBD can reduce chronic pain and can even prevent nervous system degeneration. In fact, it has been approved in Canada for multiple sclerosis and cancer pain. What’s really amazing is that CBD doesn’t cause dependence or tolerance, so it’s a great choice for those trying to stay away from opioids. Other Remedies to Consider: Not into CBD? Research also shows that turmeric consumption and heat therapy (like sauna use) may be helpful as well. A low inflammation diet also seems to be helpful for some people. CBD has anti-seizure properties that have been shown to successfully treat drug-resistant children who have epilepsy (with no side effects!). In one study published in the New England Journal of Medicine, CBD decreased frequency of seizures by 23 percentage points more than those taking a placebo. Other Remedies to Consider: Childhood epilepsy is a serious condition and it is important to work with a qualified practitioner with a specialty in this area. Emerging research also shows that a ketogenic diet can be very helpful for drug resistant epilepsy, especially in children. According to the Anxiety and Depression Association of America, depression affects 6% and anxiety affects 18% of the U.S. population each year. Research shows that CBD oil can help with both. CBD has been shown to reduce levels of stress and anxiety in those suffering from conditions such as PTSD, social anxiety disorder, and obsessive compulsive disorder. CBD even reduced the stress and discomfort surrounding public speaking. Though a B12 deficiency may also be to blame, CBD has been shown to reduce depression by enhancing both serotonergic and glutamate cortical signaling (both are lacking in those with depression). Other Remedies to Consider: Dr Kelly Brogan provides a lot of helpful information for anxiety and depression in this podcast episode. Vitamin B12 is also linked to mental health and it may be helpful to work with someone experienced in optimizing levels of B12. Researchers discovered that cannabinoids (including CBD) have an unusual ability to destroy bacteria (especially drug-resistant strains). More research is needed to find out how and why it works. A 2011 study found that CBD can also slow the progression of tuberculosis in rats. Researchers concluded that CBD likely does this by inhibiting T-cell proliferation, rather than possessing antibacterial properties. Whatever the mechanism is for destroying bacteria, CBD seems to be a potent weapon against the antibiotic resistant “superbugs” that are becoming more and more of a problem today. Other Remedies to Consider: Don’t want to try cannabidiol? There is also research on using garlic, honey and oregano oil for drug resistant strains, but work with a practitioner experienced in infectious disease. Chronic inflammation is a huge problem in our society that contributes to many non-infectious diseases including heart disease, cancer, Alzheimer’s, autoimmune disease, and more, according to the National Center for Biotechnology Information. Diet and lifestyle play a huge part in chronic inflammation but when folks are already eating a healthy, nutrient-dense diet and optimizing their lifestyle (getting enough sleep and exercise for example), CBD oil can help. 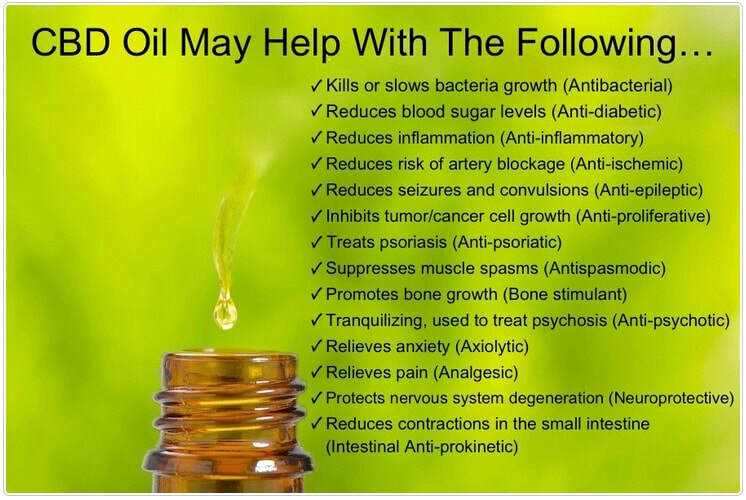 Research also shows that CBD oil can reduce chronic inflammation that leads to disease. Other Remedies to Consider: Research agrees that it is important to address gut health to manage inflammation. Removing refined sugar from the diet has also been shown to reduce inflammation in as little as a week. Schizophrenia is a complicated and serious disease that is typically managed through therapy and pharmaceutical drugs (that carry hefty side effects). Anecdotally, many folks have found that CBD oil has helped reduce hallucinations. Research is beginning to catch up too. A March 2015 review of available research found that CBD was a safe, effective, and well tolerated treatment for psychosis. But more research is needed to bring CBD into clinical practice. It should be mentioned that THC, the psychoactive compound in marijuana, may actually increase psychosis for those at risk. CBD oil, on the other hand, only helps reduce psychosis and may even counteract psychosis brought on by marijuana use. Cannabidiol can help maintain healthy blood sugar, stimulates genes and proteins that helps break down fat, and increase mitochondria that helps burn calories. As mentioned earlier, CBD oil is helpful in preventing oxidative stress and inflammation. Both of these are often precursors to heart disease. CBD oil can be used topically to treat skin conditions. Studies show CBD oil can help treat conditions like eczema by encouraging abnormal cell death. It can also help regulate the skin’s oil production, reducing acne. CBD also contains many nutrients like vitamin E that help improve and protect the skin. Other Remedies to Consider: Diet is vitally important for skin health. Many people find that removing foods like sugar, dairy or grains (if sensitive) improves skin. I also personally use a skin probiotic spray that has made a huge difference for my acne prone skin.